The release of historical British satire The Death of Stalin in Russia has been barred by the country’s culture ministry, with one official describing the film as “ideological warfare”. The Russian Ministry of Culture announced on Tuesday that they had withdrawn the film’s screening licence following a private screening for officials on Monday night. The move follows earlier reports that officials had discussed pushing back the film’s premiere until after the country’s presidential elections in March. In a statement, the head of the ministry’s cinema department, Olga Lyubimova, said that the film “contained information which was illegal to broadcast in the Russian Federation”, but did not specify further. The head of the Culture Ministry's Public Council, Yury Polyakov, was also among the film's critics, and condemned the movie as “ideological warfare”. “Not one person [on the council] has supported this film on artistic or historical grounds”, he said. Officials had already spoken publicly about plans to delay the film’s release on 25 January so as not to offend the country’s war veterans. Russian politician Pavel Pozhigailo said that the movie’s Russian premiere would be pushed back from its January release so as not to taint celebrations marking the 75th anniversary of the end of the Battle of Stalingrad on 2 February. Pozhigailo also said that the film’s release would be “undesirable” before the Russians went to the polls on 18 March. Centring on the final days of Soviet leader Joseph Stalin in 1953 and the subsequent power struggle, The Death of Stalin is an adaptation of Fabien Nury’s graphic novel of the same name. 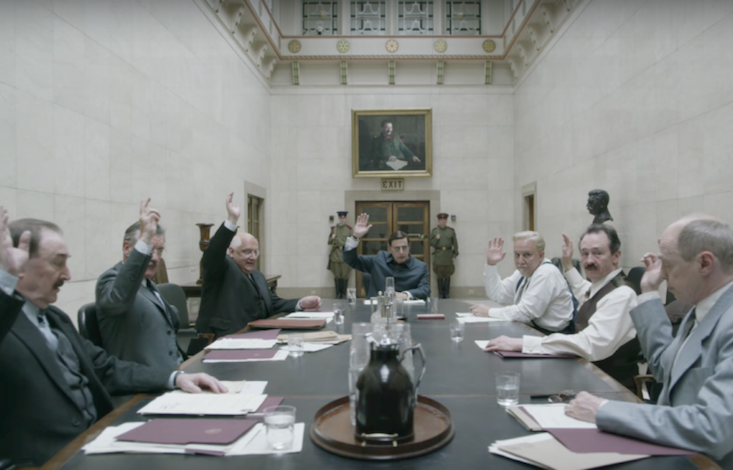 The film features an all-star cast of British and American actors, including Steve Buscemi as Nikita Khrushchev, Arrested Development's Jeffrey Tambor as Stalin’s brief replacement Georgy Malenkov, Monty Python star Michael Palin as Vyacheslav Molotov, Jason Isaacs as Georgy Zhukov, Simon Russell Beale as Lavrentiy Beria and Homeland actor Rupert Friend as Stalin’s son Vasily.